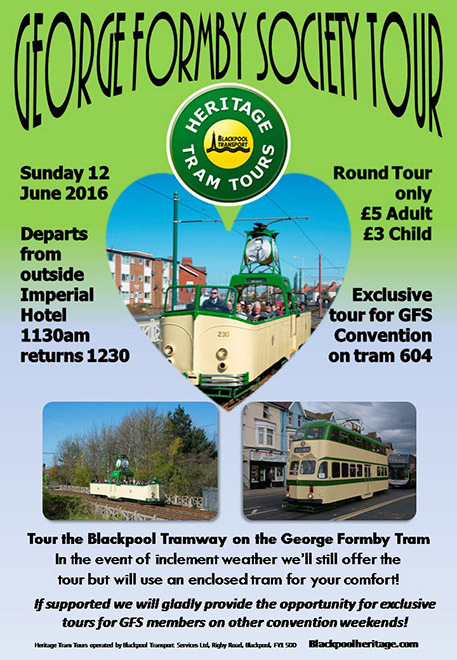 Fancy a ride around Blackpool on the George Formby tram? Make it happen on Sunday morning at 11:00 outside the Imperial Hotel when the tram will be waiting for you. The ride is £5 for adults and £3 per child and embarks from the Imperial at 11:30 and returns at 12:30. Everybody should take the opportunity to travel on this lovely tram and even if the weather is not good, an enclosed tram would be provided. Check out the poster for further information (just click with your mouse to enlarge it) and of course, more details over the convention weekend. Read about the launch in 2012 at the June GFS Convention.